Mogami MIDI05 5ft MIDI Cable by Mogami at Right Clearing. MPN: MIDI05. Hurry! Limited time offer. Offer valid only while supplies last. Mogami MIDI Synchro cable assemblies are specially designed for use with the Musical Instrument Digital Interface (MIDI) communication system. 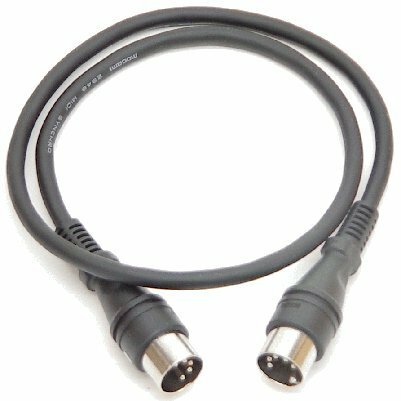 Mogami MIDI Synchro cable assemblies are specially designed for use with the Musical Instrument Digital Interface (MIDI) communication system. Applications include the latest MIDI patchbays, and interconnection between MIDI equipment and MIDI served musical instruments. These outstanding professional cables offer the following features: One piece molded 5pin Din connectors. Low profile two stage molding for easy handling, reliability and long life. 0.76µ gold plated pin version available to order. Specially designed, superflexible cable with four #25AWG copper conductors and served (spiral) shield. Attractive, durable, satin black rubber like PVC jacket. Fast, accurate transmission of MIDI signal via a twisted pair for better electromagnetic noise rejection. Additional two pins wired for tape synchro signal.